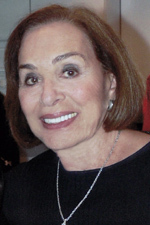 Flora Schwartz Kaufman, 89, of West Bloomfield, Michigan, died after sunset on 15 January 2019. The Funeral was held at IRA KAUFMAN CHAPEL on Friday, 18 January 2019 at 11:00 AM . Rabbi Joshua Bennett and Cantor Neil Michaels officiated.